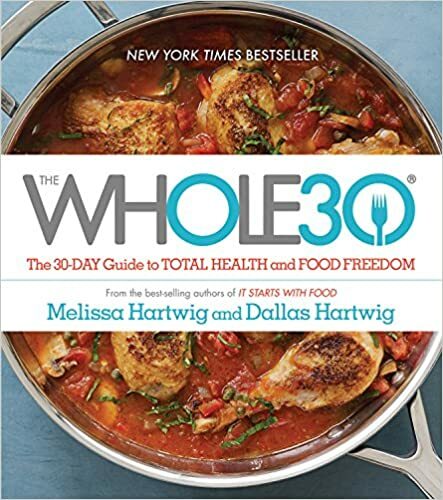 As mentioned in this post, I’ve been poring over The Whole30: The Thirty Day Guide to Total Health and Food Freedom a lot over the last few weeks. Today, my husband and I have reached Day 28 (justtwomoredays!!!!) of our Whole30 experience. It’s thirty day period of taking everything out of your diet but fresh meat, vegetables, fruits, eggs, and some nuts. That is all you eat for 30 days. It’s along the the lines of paleo, but with a different theory and intention. The theory isn’t that we should eat like this because our ancestors ate like this, or even that we should always eat like this. The theory is that what we put in our body effects us and wouldn’t it be a good idea to figure out how the stuff we eat makes us feel? Maybe you have zero problems with dairy, or maybe you’ll find you actually have an intolerance. Maybe you’ve been eating way more processed grains than you realized, or that your diet is a lot further from “natural” than you would have thought. (Maybe I’m speaking from experience…). Oh, and it’s very likely you’re addicted to sugar. And it’s also likely that your body is completely hooked on sugars as an energy source instead of using fats .That’s the number one reason why I did this program, in fact. I reached for some form of sugar, be it unhealthy sweets or “wholesome” granola bars, pretty much any time I was hungry. But really, the reason we got to this point where we decided to do something that makes everyone who knows us think we’re lunatics is that we wanted to get our indulgences under control. We’d spent years eating whatever dessert was available, whatever meal was easiest to make on a rough day, etc. It was time for a change, and how hard could it be to do this for 30 days? There were some great times and some hard times! I was extremely tired at first. Melissa Hartwig and Dale Hartwig write in their book that we have trained our bodies at a cellular level to use energy from the sugar we eat instead of the fat we eat or store. I was kind of skeptical about this, but when I felt how tired I was on about Day 3, I decided, “Yes. I am tried on a cellular level right now.” And then around Day 6, I felt a steady energy, much different than the kind of energy swings I had been experiencing. Other than better energy, losing an inch or two, and feeling pretty good overall, my husband and I did not make any amazing discoveries about what foods affect us negatively. Our bodies seem quite happy with wheat and dairy! In fact, since about Day 25, we’ve been feeling the pendulum swing from too much wheat in our diet to not enough. Our bodies need some grains! I’m really glad I bought the Whole30 book, because many of the recipes are keepers! We will keep eating menu items like Chicken Cacciatore, Harvest Grilled Chicken, Salad, and the beef brisket recipe found in the book. The salmon recipes we tried from the book were not our favorites. It’s our humble opinion that salmon needs some kind of sweetness in the marinade or sauce to take it from “meh” to delicious. We also were not fans of two of the breakfast recipes we tried that I found on Pinterest: Cauliflower Sausage Casserole (the smell was one of the worst smells ever! I ate it a few times, but my husband hated it and we won’t be making that again.) and Breakfast Pumpkin Custard (it was icky). This online recipe for Greek Meatballs was awesome, though! And we discovered we actually like sweet potatoes, though not as a sweet dish but a savory side dish. While we’re on the topic of recipes, I would just like to say that the absolute hardest part of The Whole30 was all the cooking you must do in order to eat. You cook at every meal, or you cook lots at once and eat leftovers. You may find a few convenience foods like a rotisserie chicken, but even those often have some added sugar in the rub or marinade. So, if you do not cook, you’re going to need another kind of plan for getting jump started on healthy eating. We all know that homemade is best, but not all of us are there yet. The Whole30 has lots of benefits, but what we are most excited about is the re-wiring our habits have gone through. Where we once ate mostly carbs for breakfast, we now eat eggs. (And eggs. And eggs). We’re planning on adding oatmeal back into our normal routines right away, but we also plan to keep the majority of our breakfasts protein-based. For snacks we used to grab crackers or whatever the kids were eating, but now I reach for nuts or fruit. And we haven’t eaten this many vegetables per day in our whole lives! I will tell you this though: as soon as I wake up on Day 31, I’m grabbing the half and half and enjoying some creamy coffee! The almond milk has grown on me, but it’s still not cutting it. So the plan going forward is to keep our new good habits, but allow ourselves flour tortillas with our fajitas, and some cheese in our scrambled eggs, and see what happens. Have you done the Whole30 before? Thinking about it? I’d love to hear your thoughts! For other food related posts from Miathereader.com, click on over here!